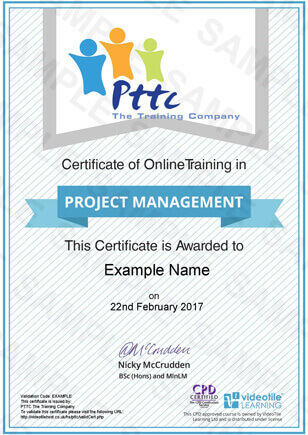 This on-line Project Management Training Course from PTTC E Learning is essential for anyone who might need to manage projects either at work or privately. It’s perfect for admin teams, construction teams, electricians, builders or anyone coming in to contact with projects or project management. Its pointless buying a course & spending time learning, when it wont fit your purpose. So our online Project Management course are 100% fit for purpose and accredited by major players in the industry sectors, so you can rest assured you wont be wasting time or money with us! Who Is This Project Management Training Course For? Our PTTC E Learning Project Management course is perfect for anyone who is either looking to manage a project for the first time or looking to improve their skills, knowledge and understanding in basic project management. A successful project requires many aspects, such as good planning, efficient management, effective monitoring and an understanding of potential risks and issues, and without these basic elements being in place a project will have a greater opportunity for failure. So this course is designed to give you and your team with the opportunity to build and develop the key skills and necessary knowledge and understand of what key elements are needed to come together to make a project successful. These skills can be used for such projects as office relocation, staff recruitment, construction works, event planning etc. So if you are looking to up skill and develop your team in project management then this course that is Certified by the Continued Professional Development Service (CPD) is most definitely for you. It will provide a far greater understanding of key elements of project management that include types of project, project life cycles, features and processes, identifying needs, SWOT analysis, risks and issues and monitoring to name but a few. Our PTTC E Learning Project Management course is packed full of information, tips, and helpful advice to keep a project well managed and prevent it from suffer the usual issues of feature creep, delays, going over budget that can prevent a project from being completed and costing organisations dearly. When a project is correctly managed by an informed and confident team that are communicating and all working to the same aims and objectives any project will have a far greater chance for overall success. This project management course is CPD Certified (Continued Professional Development service) and designed to give a firm understanding, and awareness of the basic key principles or good project management, while also providing you and your team with the necessary knowledge and skills to plan confidently and effectively to reduce the risks and issues that a project can face while increasing the projects overall changes success. Our Fully Accredited and Industry Approved On-line Project Management Training Course is aimed at anyone that may come into contact projects or project management within their day to day duties at work. This section will walk you through the Project Management. This section will discuss Types of Projects, Project Lifecycles, Terminology, and the elements of Features and Processes Involved in Projects. This section will explain the Types of Needs, Identifying Needs, and SWOT Analysis. This section will explain how to set effective and practical Aims and Objectives. This section will walk you through how to take Project Milestones, and Risks & Issues. This final section will explain how to Monitor Change, project Stakeholders & Terminology, and then Ending a project. This online Project Management course has the vital content to provide employees with Project Management Knowledge & Skills in an online course format. Our highly engaging and learner friendly course is CPD Certified (Continued Professional Development service) and it is designed to give cost effective, low stress and time efficient training experience that will provide you and your team with a good understanding, and awareness of the basic key principles or good project management. Once you or your team members have worked through all of the 6 modules, with the 16 professionally filmed HD video lessons, which will take around 2 hours, they have must successfully have answered 75% of the questions that are posed at the end of each module. They can then simply download the CPD Certified certificate. If you are not sure if our Online Project Management Training Course is the right course for you, or if you’re a bit dubious as to the quality of our training course will be what you’re expecting why not try one module of the course of your choice inc the assessment FOR FREE . This will give you a free chance to experience hands on our on-line learning environment. To get a Free Trial Just click on the ‘Free Trial Logo & follow the video instructions to access the online learning area. Once you have trialled the module you will then be given the option to purchase & continue with your course! Our On-Line Project Management Training Course has 90 minutes of video to watch, and 30 questions to answer. We estimate that the course should take you no more than 2 hours to complete. If you want to do it over a number of days then that’s fine, the system will remember where you left off and you can go back to it at exactly that point. Yes, our Project Management Training Course is, the course is CPD Certified (Continued Professional Development service) so you can rest assured that this course will meet your needs if you are looking for a competent introduction to the Project Management Training Course. There no problem with that, with our system you get 3 chances as standard to take and successfully pass the Project Management Training Course. If you are still unsuccessful at that stage, then just drop us a line and we will provide you with 3 further attempts FREE OF CHARGE. Once you have watched the 16 video lessons and successfully answered the 30 questions, gaining a average 75% average pass rate you can then simply download and print off your Certified CPD Project Management Training Course certificate. This type of training gives lifelong knowledge & skill. There is no legal need currently to take the Project Management Training Course again, however like any skill or knowledge we learn memories fade over time especially if we don’t use those skills. So, you can always come back again if you wanted to and refresh your skills and update your knowledge by purchasing and completing the course again. That’s easy as well. You can pay for your Project Management Training Course online with your credit card, debit card, or PayPal. However sadly we no longer accept cheques, sheep, horses, or gold.